These exertions by the man who later became Sir Peter Hesketh Fleetwood and pioneered the creation of our town were preliminary to much building activity. When this letter was written the word “Fleetwood” on Greenwood’s map of 1818 referred only to his Uncle Bold’s Fleetwood Farm. The first stone-laying ceremony on the windy rabbit warren was not widely publicised. On 7th April 1836 tenants of the Rossall estate, servants from Rossall Hall and a few interested people from around the Fylde gathered round Peter as he performed the ceremony on the south bank of the River Wyre at Burn Naze. The place was officially named Wyreton and was intended as the industrial area; later ICI occupied this site. The harbour was to be know as New Liverpool. The name Fleetwood was reserved for the elegant watering place overlooking Morecambe Bay. According to custom, beneath the foundation stone were placed coins of the realm. That scene in the salt marshes must have resembled some outpost of Empire, for as cheers rent the air, proudly waving above all heads was a Union Jack. There was of course no photographs in 1836 but, as when Queen Victoria called at “the newest town in all her dominions” over ten years later, an engraving did appear in the Illustrated London News. Peter had friends in London, not least Queen Victoria herself. Buildings were already rising in Dock Street, the opening of the Preston and Wyre Railway being but four years away. Excitement and anticipation were in the air. Since that historic day there have been many stone-laying ceremonies and recently two photographs came to light which prompt the opening question of this article. A crowd of townspeople are shown in these two wonderful scenes and if you are Fleetwood born and bred some of your ancestors would well be in the pictures. 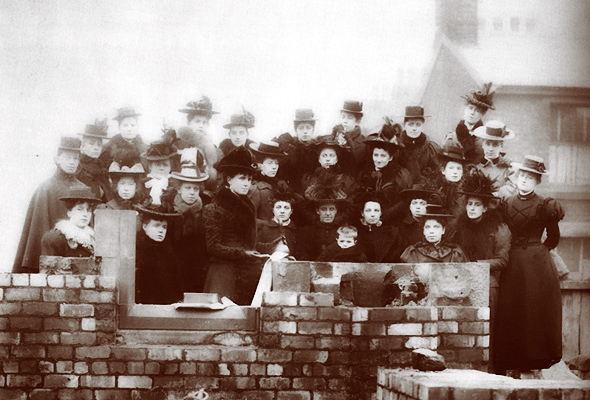 The older, showing a group of ladies at a brick-laying ceremony, I believe to be from August 1889 when the Wesleyan Methodists had decided to build a new Sunday School (approximate cost £1350) and a magnificent new Church, Methodism having grown apace. The opening fund raiser was a popular bazaar and there are still some commemoration mugs about, giving the date. Memorial stones were laid by John Anderson, Thomas Smith, Thomas Cumpsty, Mrs Fielding, Mrs Joseph Jackson and Miss Porter. The brick-laying ceremony followed and I was told many years ago by a lady who was present that for each brick you paid one guinea and some ladies had their initials incised upon the brick. There was a similar occasion for the children in connection with the new Sunday School. All worked with a will. By 1892 they had bought a new organ and within a few years the “crippling debt” was paid off. Not a brick remains. The whole splendid Wesleyan Methodist Church has gone and another risen behind the Mount. Their first site was open warren and it is recorded: “Devoted Methodists beat a track across the shifting dunes with carts and wheelbarrows full of tools.” About the time of this photography they had some fiery speakers, with hour-long sermons. The closing of the old chapel was a memorable occasion. At the last service “North Church Street was blocked with crowds who had assembled for the ceremony of locking the Chapel doors.” Mr William Leach, the oldest member, related how far removed from streets and buildings the original chapel had been and how the faithful had trodden a path over the sand. So, if your grandma or great aunt is in the photograph above, do let us know. Names to faces would be interesting.